This bold kimono by Linda Skuja is a great project for going crazy with colours! This pattern is available inside issue 104 of Inside Crochet. Not a subscriber? Order a copy online and download a digital edition straight to your smart device. 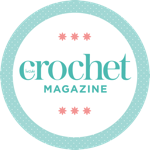 ● Linda Skuja is a crochet designer specialising in innovative techniques and fashion forward designs. Look for her as ElevenHandmade on Ravelry and Instagram to fi nd out more about Linda’s designs.